Is setting up this network security camera as easy as it should be? 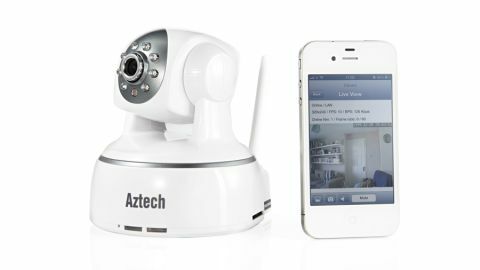 Home security used to be an exclusive business, but now you can buy a network camera for under £60 (about AU$90, US$93). However, the Aztech WIPC402 clocks in at £100 (about AU$150, US$155), so why pick this over a more budget-friendly option? It's more expensive because it enables you to pan and tilt the camera directly from your iOS device, and has plenty of other features to boot. It's also got built-in Wi-Fi, so just needs to be plugged into the mains. There are infrared LEDs around the lens for night vision, and the camera comes complete with a kit for ceiling or wall mounting should you wish to do so. An accompanying app runs alongside the camera. It worked in terms of detecting our camera first time, but leaves a lot to be desired in terms of polish. After the first time set-up, it also found our camera easily when connecting over 3G (port forwarding must be enabled on your router, though). The app itself isn't iPhone 5-ready, and it lacks the ability to alter some of your camera's more advanced settings such as the time, although it will let you use the camera adequately enough and it will also let you specify a password for your camera and change the video quality. For settings other than those included within the app, you'll need to log into the camera using the included PC software (on a CD and not available for download) or through a web browser. However, we had a further problem. We were initially able to connect to the device since the instructions ask you to connect the camera up to your router using an Ethernet cable for set up. But, try as we might, we just couldn't get the app to accept the password for our wireless network. And so again, we had to do that using the software utility. The app does enable you to save images from the video stream to the app - though not to the Camera Roll - as well as listen to what's going on around the camera. If you connect up some speakers to the camera through a 3.5mm jack, you can also broadcast audio messages from your iPhone, iPod touch or iPad directly to the camera. Another port enables you to connect up an alarm system if you wish (but once again, this isn't configurable from the app). Panning and tilting using the iOS app is hard work, since you swipe the image to make it happen. Each gesture only makes the camera move a short distance, so if you want to go to the extreme left from the extreme right, it really is a lot of effort. You can't record video on the iOS device, but you can insert a 32GB or smaller SD card into the side of the camera and record video directly to it. Unfortunately, there's no recording to the cloud. While this is an excellent and comprehensive network camera, it's let down by the limited and at some times plain ropey companion app. If you want to completely control and interact with such a device from your iPad or iPhone, then we're afraid you need to look elsewhere - D-Link's DCS-5222L is an equivalent model that also boasts video recording to the cloud through D-Link's own online service.